While reading The Waiter by Matias Faldbakken (author of the award-winning Scandinavian Misanthropy trilogy) I felt that I was watching a European art film. 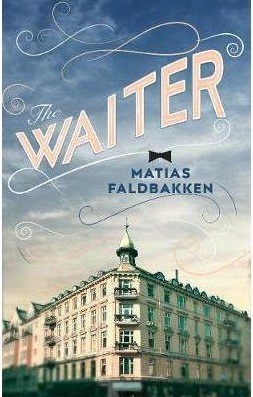 It had all the right ingredients – a somewhat oddball and intensely OCD leading character, a moody setting (The Hills restaurant, once the most esteemed establishment in Oslo, now falling somewhat into disrepair) beautifully-filmed and incredibly detailed scenes, all taking place at a rather slow pace. “So, with the coffee pot in hand, proudly and self-effacingly, I went over to the man sitting beneath the mirror. He was wearing the tie from hell, the pattern on it so busy that I lost my momentum and simply stood in front of him for a few seconds, completely unable to mobilize any of my standard phrases. And, as he stiffly asked for a refill, no doubt rather puzzled by my silence, I proceeded to collapse. The above takes place on page 42 of 226, so the waiter has a long way to go into the depths of depression and inner confusion, brought about by the various characters that inhabit the pages. They are mostly regulars and they come and go, some more often than others. Anything out of the ordinary hum-drum routine of his diners causes the waiter more anguish, like a no-show at a table for four towards the beginning of the book. Three diners at a four-seater table is a severe blow to the waiter’s sense of decorum and the respectability of the restaurant. The offending fourth guest (an attractive woman) arrives the following day, causing great consternation amongst the restaurant staff, all of whom seem desperate to find out exactly who she is, and which of the three other diners she might be attached to. Unfortunately, we never find out, as is also the case with the conclusions to any of the other guest machinations. The book just ends, leaving us with a “what happened?” feeling, which is really quite odd. Perhaps the author has a sequel in mind, but I’m afraid I won’t be waiting with bated breath for it to hit the bookshelves. But please don’t be put off – if you are into European art films and enjoy long descriptions of Scandinavian artworks, then you might very much enjoy this novel.